I was going to use this request to try my butterscotch blondies recipe as an excuse to post a few blond jokes, but I decided that wouldn't be fair. Judging people's intelligence by hair color is just wrong... anybody could open a box of Cheerios and think it's donut seeds. Anyway, I hope some of you give this recipe a try and let me know what you think. Enjoy! Add the flour, baking soda, baking powder, and salt to a mixing bowl. Stir with a whisk to combine. Reserve. In another large mixing bowl, whisk together the melted butter and sugars until combined. Add the eggs and vanilla, and stir to combine. Switch to a wooden spoon and stir in the flour mixture. Fold in the butterscotch chips, chocolate chips, and cashews. With a spatula, scrap the batter into a lightly greased 8 x 8-inch in pan or glass baking dish. Smooth to distribute evenly. Bake for 30 minutes, or until the top is golden brown and a toothpick inserted in the center comes out clean. Cool before cutting into 9 bars. I would love some now with a cup of hot coffee....mmmm....delicious! Do you do all your own photography? I can just taste this because the picture is so good! yes, for better or worse, I do all the photos. Donut seeds? I don't get it. And I don' think it has anything to do with my blonde hair. Some days you are just funnier than other days. OK, I'll assume you're kidding about not getting the donut seed joke...God I hope you're kidding... (um, because cheerios look like little tiny donuts, and can easily be mistaken for seeds used to grow donuts) I really hope you were joking. Ha Ha! Sorry John, but I don't think she was kidding! I will be test making this recipe today and post how they come out. I'm off to the store right now! BTW--what is your signature dish? Every chef has one..I'm curious. Hi Chef John, as promised these were made a couple of times (trying out both dark and light brown sugar) and the texture and flavor is very good. Very nice recipe and will surely make it again! Little on the 'dense' side, but very tasty. 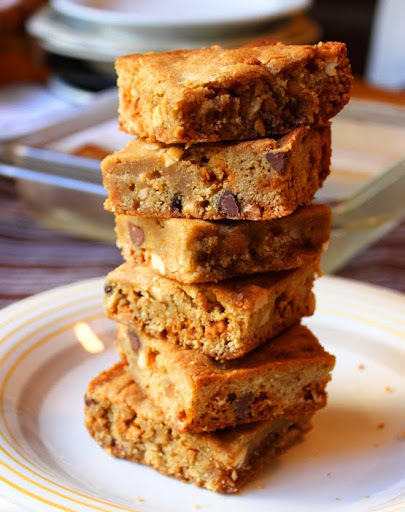 Sugary butterscotchy goodness with a slight crunch of cashews and then a splash from the chocolate chips. Very nice! May wish to check the cook temp/time as each time it took about 15min longer then what you posted I thought that was unusual enough to note back to you. Whole house smells great while baking. Thank you again for sharing your recipes with us. thanks for the report! Strange that mine cooked in 30 minutes. Maybe mine were slightly under done? Also, I think they should be a very dense moist bar, so that's okay with me. Thanks!!!!! update: regarding the cooking time. I've been checking other recipes online that use 350 degrees. Most times range between 25 and 35 minutes. I think it may be that they are intended to be pretty moist/chewy inside. AHAHAHAHA! donut seeds. i love it! i never heard that one before - but i'll use it now. as always, you make my day. Awesome.Everyone at work loved them. So I made these... but I just used chocolate chips (kind of taking away from the WOW factor, but it's all I had). They were really good, I licked my spatula after I spread them out and it reminded me of butterscotch brownies! (Super buttery) I was pleased (first time ever having a blondie). Thanks for the post! I made these this weekend and the flavor was great. But, unfortunately I ended up overcooking because after 30 minutes when I took them out of the oven they had this really gooey center that made me think they were not done. I actually don't see how they were edible in that condition. So, I stuck them back in the oven for 10 additional minutes and they came out hard as a rock! LOL! Finding the right amount of cooking time seems to be key. I am not going to give up that easy and will try this recipe again. Would appreciate any tips regarding the cooking time. Thanks! Chef John! You are amazing! I know I am way late to the discussion about cooking times, but I made these today and felt the need to chime in. They turned out perfect for me after 30 minutes in a 350 degree oven. The toothpick came out clean, and after a long rest to cool down, I found them to be moist and pretty darn delicious. As an expat living in France who sometimes really misses home, I can with certainty that these will be a BIG hit with my family. Well, so many of your recipes are! Keep on rockin', Chef John!